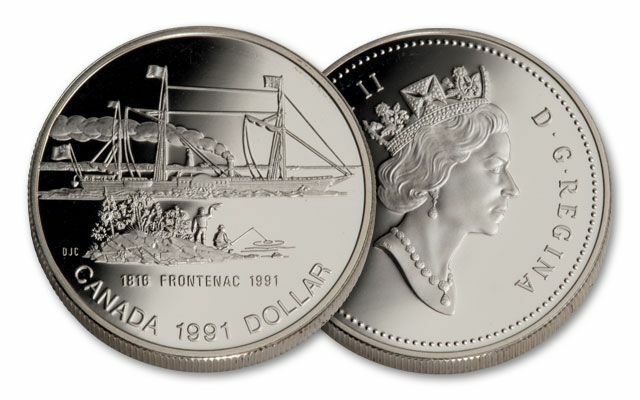 This 1991 Canada Silver Dollar Proof commemorates the 175th anniversary of the first steamship to sail on the Great Lakes: the S.S. Frontenac. Its voyage established a regular passenger and freight route between Prescott and Burlington, thus becoming the first Canadian steamship to operate on Lake Ontario. The obverse of the Silver Dollar features a portrait of Queen Elizabeth II facing right with the lettering: ELIZABETH II D·G·REGINA. The reverse depicts the S.S. Frontenac with two masts behind a small island, which holds two fishing men above the dates, and words "1818 FRONTENAC 1991". Lettering: CANADA 1991 DOLLAR. The coin is struck in 23.3 grams of 50% silver. The first steamship to navigate Lake Ontario, the S.S. Frontenac was launched on September 7, 1816. Its wooden hull was 170 feet long, and like most early steamboats, was equipped with masts and sails in case of engine failure. In its time, the Frontenac conducted regular runs across Lake Ontario between Kingston, York and Niagara-on-the-Lake, but rarely managed to make money in its 8 years in operation, as the provincial population was too small. Designed to carry freight and passengers, it was a boon to travelers, greatly reducing the difficulties and the cost of travel between Kingston and York; however, more sophisticated ships soon rendered the Frontenac obsolete. In 1825, the Frontenac was sold to John Hamilton, a wealthy landowner and one of the founders of Queens College (now a university) in Kingston, Ontario. Secure this Canada commemorative Silver Dollar for your collection today!